Tiziano Vecelli or Tiziano Vecellio (c. 1488/1490 – 27 August 1576), known in English as Titian, was an Italian painter, the most important member of the 16th-century Venetian school. He was born in Pieve di Cadore, near Belluno (in Veneto, Republic of Venice). During his lifetime he was often called da Cadore, taken from the place of his birth. Recognized by his contemporaries as "The Sun Amidst Small Stars" (recalling the famous final line of Dante's Paradiso), Titian was one of the most versatile of Italian painters, equally adept with portraits, landscape backgrounds, and mythological and religious subjects. His painting methods, particularly in the application and use of color, would exercise a profound influence not only on painters of the Italian Renaissance, but on future generations of Western art. 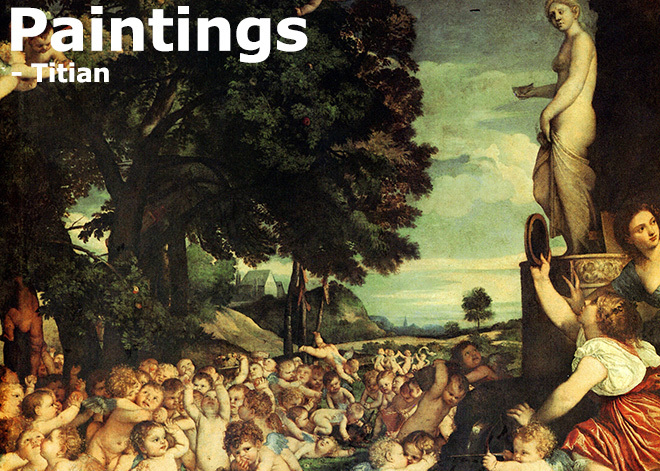 Best of Painting Collection, 255 Artworks by Titian.